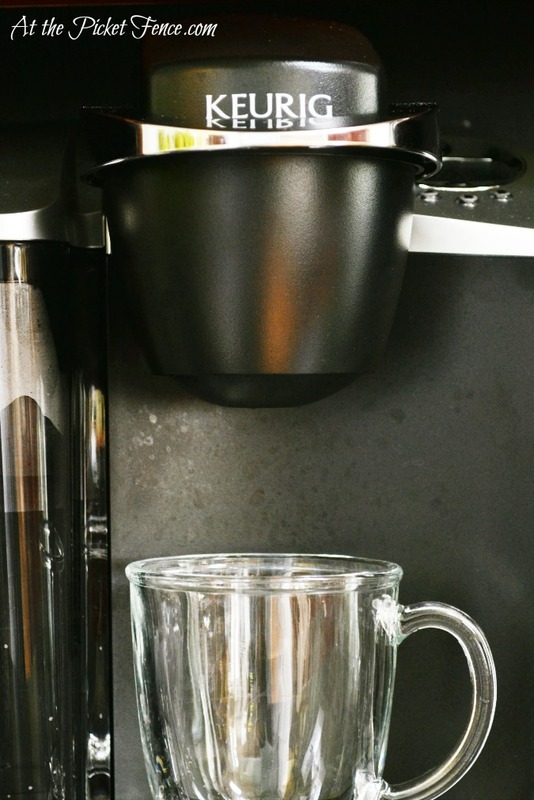 This story all begins with a Keurig…well…actually, I think it goes back further than that. Back to a day in 2008 when we were touring a house in a neighborhood we loved. One we had driven through countless times and had always said, “wouldn’t this be a great place to live?” We had been looking at houses for what seemed like forever and had almost reached the point of giving up. Maybe it wasn’t the right time for us to move after all. And then we got a phone call from our realtor telling us about a house that had just come up for sale that she thought would be PERFECT for us. It was a unique situation. The previous owner had fallen on hard times and would have lost her home had it not been for a friend (who happened to be a broker) purchasing it. It had sat empty for awhile before finally going on the market. She told us we shouldn’t wait. We needed to tour it ASAP! So, I bundled up my then 4 year old son and not quite 1 year old daughter and we high-tailed it over to this so-called PERFECT house. It was getting late in the evening and the electricity had been turned off so we did much of the tour by twilight. But, the moment I walked into the kitchen I felt like a light-bulb went on. It had 20+ year old appliances, wood floors badly in need of refinishing, granite tile pieces missing and cabinet doors hanging off of their hinges. The view out the windows was obscured by the overgrown blackberry bushes and I was pretty sure I saw a tree growing through the boards of the deck. But to me, it was PERFECT. I could just see myself in there cooking away, kids sitting up on stools at the counter or running through as they chased each other around the perfect loop that was created by the layout of the house. It had loads of cabinet space, a wonderful pantry and more drawers than I had things to put in them. 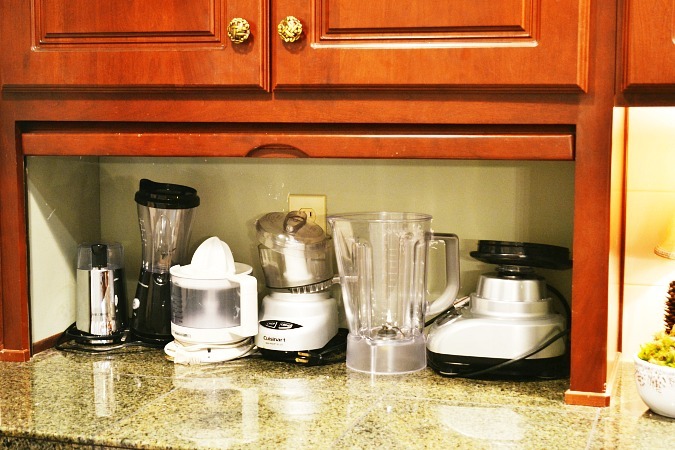 Then, as we prepared to move on to the next room I glanced back at the kitchen and saw it…slatted wood underneath one set of upper cabinets with what looked like a little handle. It was an appliance garage. At least that’s what we assumed it was because the door was stuck and we couldn’t open it. But a few weeks later, after the house finally became our home, my husband and father-in-law quickly set to work getting that teeny-tiny garage door un-stuck. 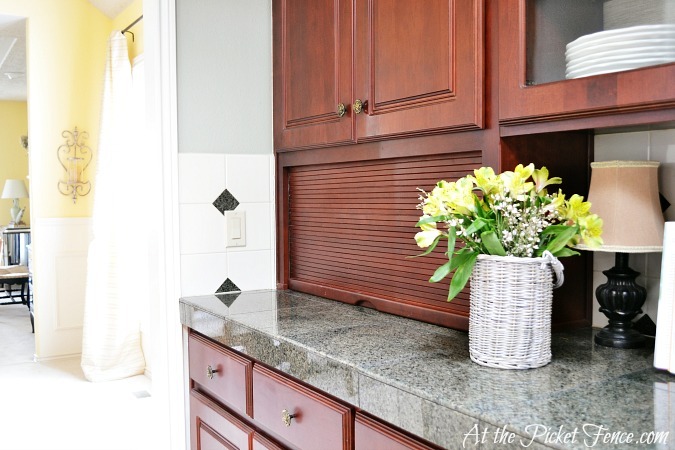 I loved having this little hideaway for my small appliances. I could just imagine them coming to life, backing out of the garage to be put to use as I whipped up some concoction and then pulling back into their garage to rest for awhile. Fast forward a few years to this past Christmas where I found a large box being set down in front of me. The tag indicated it was from my husband and I couldn’t believe it when I opened the box and discovered a long coveted item but one I could never bring myself to buy. Sigh…have I ever told you how much I love coffee? As in I can’t form real sentences until I have the first sip of that first cup first thing in the morning. It’s a glorious thing. And the Keurig makes it that much more glorious! But, while I loved it with an almost irrational passion, frankly it took up a bit more counter space than our old coffee maker (which I couldn’t part with by the way!). So, I decided it needed it’s own special home. And turned the appliance garage into a coffee station! And I figured, if I was going to give the Keurig it’s own special home I might as well make it…well…special. A couple coats of chalkboard paint later and I had myself the perfect recipe for a great start to the day. Caffeine + sugar free flavored syrup + encouraging words = a happy mama ready to tackle anything that comes her way! That first morning after I created my little coffee station, I woke up before the rest of the household just like I always do. It was still pitch black outside but I forced my body out of bed, pulled on my robe, slipped my feet into my slippers and rubbed my bleary eyes. I quietly made my way downstairs and headed to the kitchen. Out of habit I walked over to the spot where our coffee maker used to be before realizing it was no longer there. 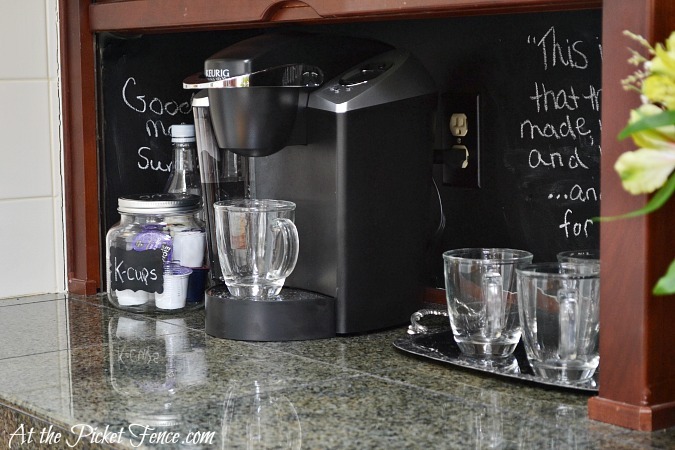 Turning around I walked over to my new coffee station, got the Keurig humming with the sound of water heating up and read the words I had written on the chalkboard wall and smiled. 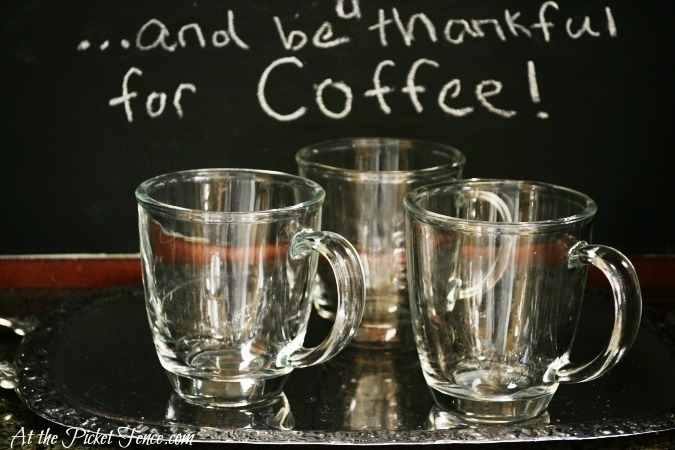 And be thankful for coffee. 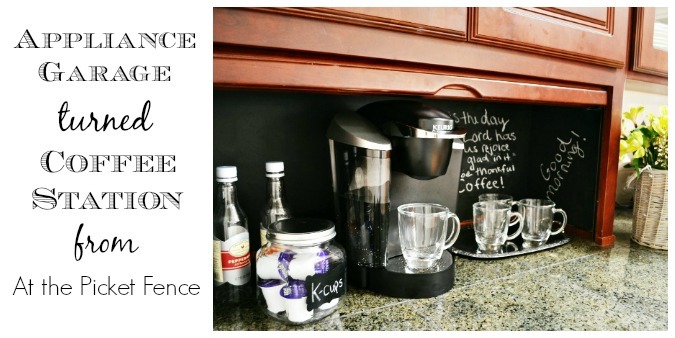 21 Comments on "Appliance Garage Turned Coffee Station"
Your coffee station is precious! While I’ve had one in my tiny little “garage” for some time, I am now inspired to take out the chalk paint to paint the back wall. Of. course, your scripture is perfect there, but I will think on another so as to not copy your. Possibly, Proverbs 3: 5-6. Love the flowers by the way! And all of y”all’s posts are really wonderful! Thank you and blessings! Lovely! Every single bit of it! 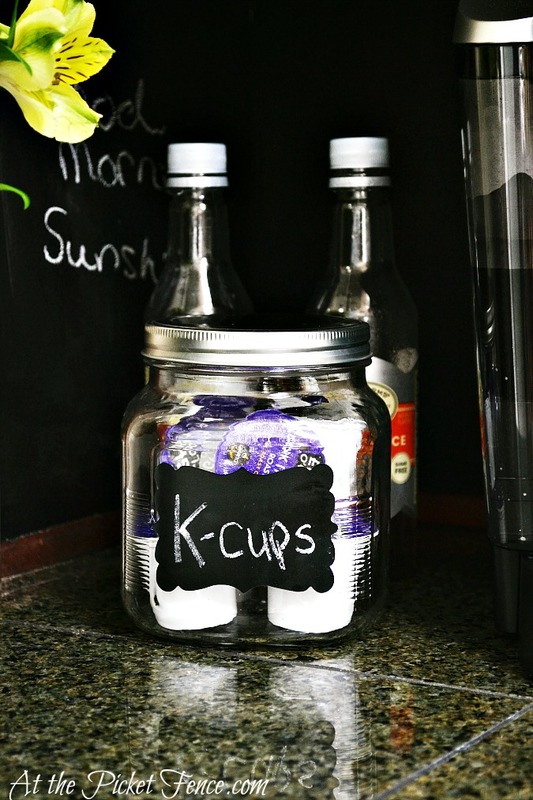 The way you wrote the post, the chalkboard paint, the door to close if it gets messy and you don’t have time to clean, and the keurig! I want one of those too – so bad. Someday! 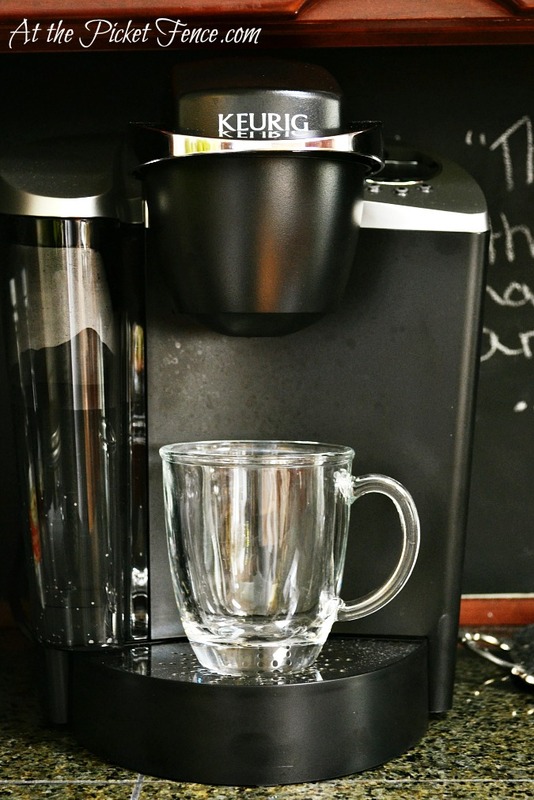 I put on a smile each morning when I walk into my kitchen and see our Keurig lit up ready to brew the coffee of my choice. It sits on a small counter next to my stove with a rotating array of K-cups (Timothy’s Cinnamon Pastry, my fav.) 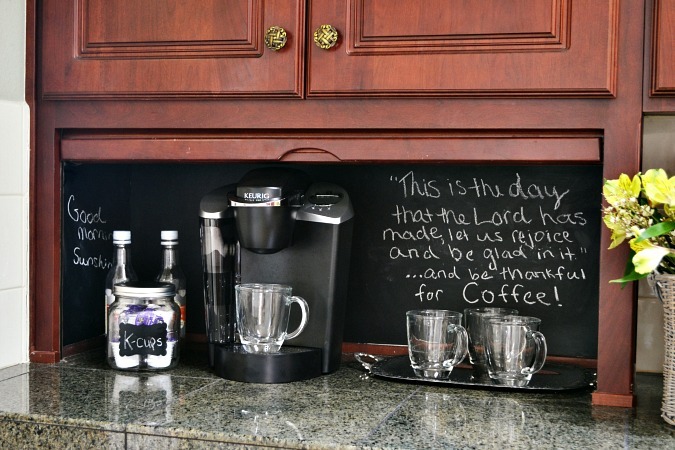 I like your coffee station equipped with mugs and flavorings and your scripture quote is one of my favorites. What a wonderful idea/project. Very creative. What a great idea! Love this! So cute. 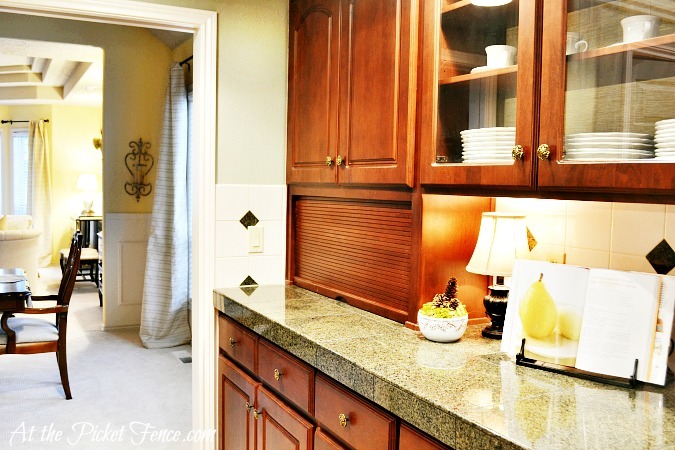 What a perfect place for your coffee station!…Love coffee too…such a great idea! What a great idea! IT’s perfect for a coffee station. The chalkboard paint is a bonus. Love it! Great idea on how to use the appliance garage. I set up a coffee bar in our kitchen at the desk area and love it. I have an office with a desk so I didn’t need the one in the kitchen. I think a coffee set up is so fancy in a house. 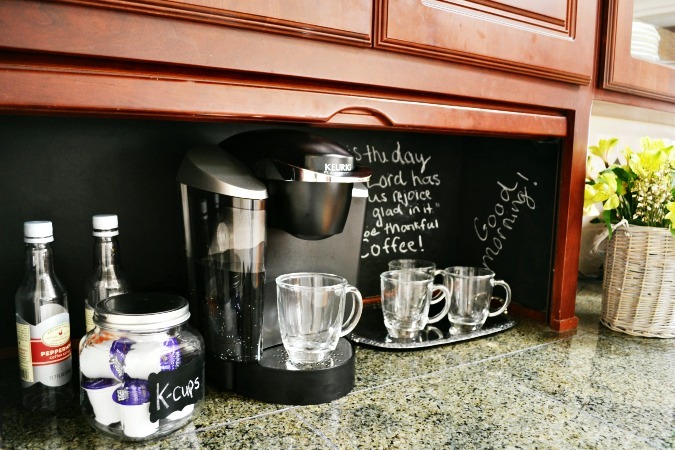 I know you will love your new coffee station. GREAT way to use that space. Me too, I thank God for coffee!!! Love this idea–great use of space now, too! Great idea! Love that chalkboard wall. Clever idea!! I’m a big java lover too! I love the silver tray you use for your cups! Pinned! 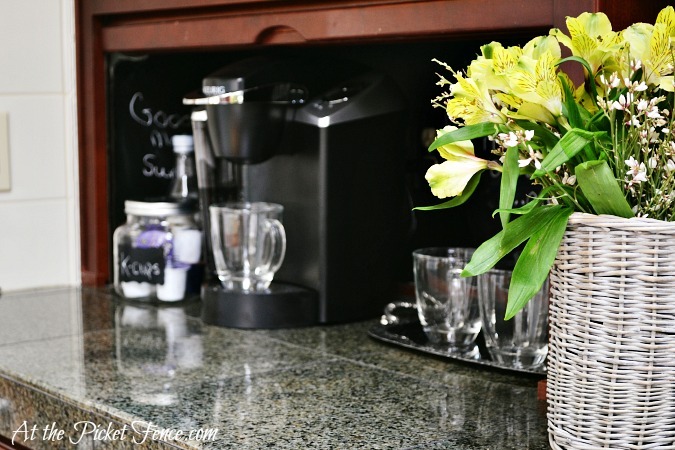 Oh my gosh… I am a HUGE coffee lover and I think your coffee station could make me love it even more!